LEWISTON - Donald R. O’Leary Jr., 59, of Byron, died Monday, Jan. 21, 2019, at the Central Maine Medical Center, Lewiston, Maine. 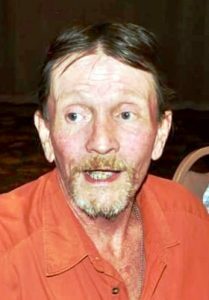 LEWISTON – Donald R. O’Leary Jr., 59, of Byron, died Monday, Jan. 21, 2019, at the Central Maine Medical Center, Lewiston, Maine. He was born in Rumford, Maine on Aug. 30, 1959, the son of Donald and Marilyn (Brown) O’Leary Sr., graduated from Mexico High School, class of 1977, and had attended Central Maine Community College. Donald worked as a cutter and sewing machine technician at Bates of Maine Textile Mill in Lewiston for many years until retirement. He loved the outdoors, especially hunting, fishing and boating. He was a former member of the Rumford F.O.E., and the Webber Avenue Club in Lewiston. He was married at Garland Pond, Byron, Maine, on June 13, 2015, to Linda Alexander who survives, of Byron. Other survivors include a son, Keady O’Leary of Lewiston; five daughters, Allison O’Leary of Brunswick, Ashley O’Leary of Bangor, Lacey O’Leary of Lewiston, Nicole Beaucage of Lewiston, and Melissa Bolduc of Auburn; stepchildren Diana McNulty and husband, David, of Arundel, and Benjamin Cloutier of Rumford; a brother, Thomas O’Leary and wife, Julie, of Crestview, Fla.; three sisters, Donna O’Leary Martin and husband, Louis, of Auburn, Jayne O’Leary Witas and husband, David, of Lewiston, and Melissa O’Leary and fiancé, Tim Bouchard of Turner; many grandchildren, nieces and nephews; and was predeceased by his parents, and a brother, Timothy. Friends are invited to sign the family guest book and share their thoughts, condolences and fond memories online at www.meaderandson.com. A celebration of his life will be conducted 2 p.m. Sunday, Jan. 27, 2019, at Daddy O’s Restaurant, 1570 Main St. (Route 26), Oxford, Maine, with Pastor Larry Hansen officiating. Interment in the spring will be at the Demerritt Cemetery, Peru, Maine. Arrangements are under the care of the MEADER & SON FUNERAL HOME, CREMATION AND MONUMENT SERVICES, 3 Franklin St., P. O. Box 537, Rumford, Maine. In lieu of flowers, please contribute to the charity of your choice in his memory.